For the first time in 40 years, the Coonley Playhouse will go on the market. The building was converted into a residence many years ago. About 40 years ago, it was acquired by the Shipper-Smiths, founding members of the FLWBC, who deleted additions and restored deletions of the original construction, including high-quality replications of the art glass windows. As a residence made out of a school, it has some oddities that a lot of home buyers probably won't relate to, so it is hoped a good steward of the building as it is can be found. Precusor to the Avery Coonley School in Chicago. For some reason I've always avoided studying this building. radical this must have been for 1912. 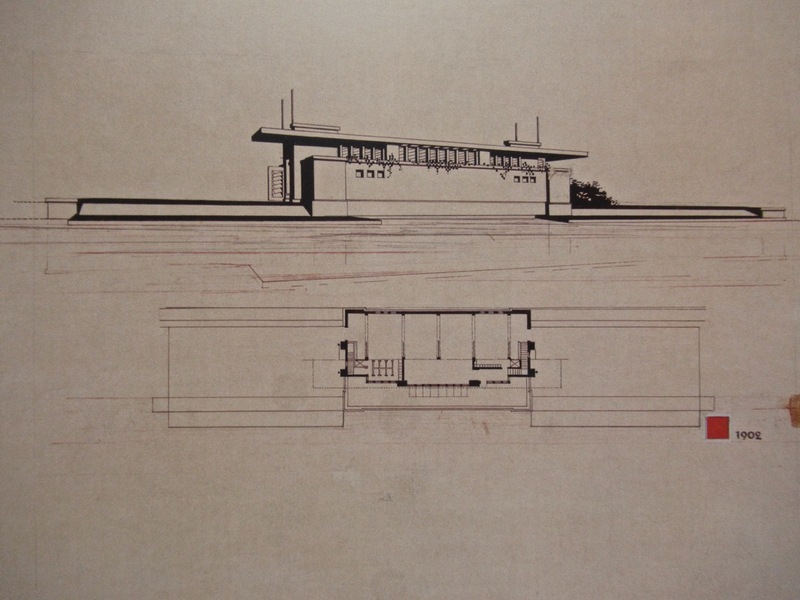 The Usonian seems to be all there. Would this actually be the first structure where the cantilevered trellis occurs above windows? For some reason I've always avoided studying this building. Not sure why. radical this must have been for 1912. The Usonian seems to be all there. As for the last ... somewhere, long ago, I read one of Marion Mahoney's blasts at FLLW ... claiming he stole the idea of the cantilevered trellis from Griffin (along with the concept of reinforced concrete block walls.) Unfortunately she didn't document her claim. Historians? Was Coonley first? Constructed, I would say yes ... without glancing. As an unbuilt element, the Call Building, though obviously different in its not being residential, is a strong precedent for the Coonley Playhouse. any other period of the career ? The Call Building .... of course. 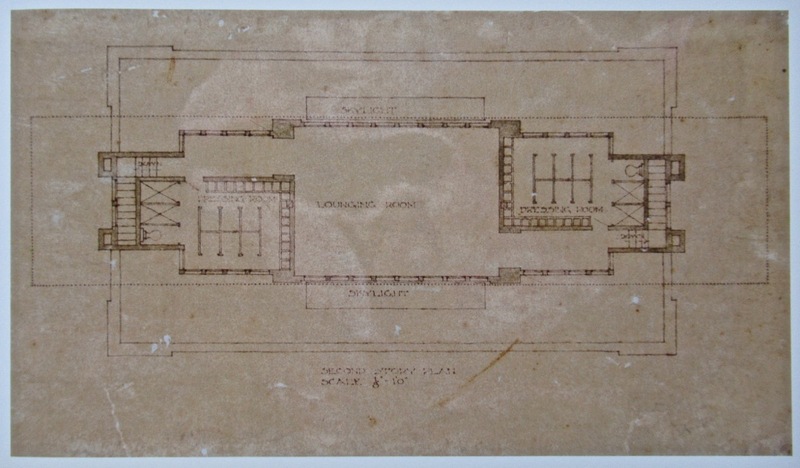 Three Quarters of a Century of Drawings gives 1911 for the Playhouse and 1912 for the Call building. Sweeney's Wright in Hollywood lists three possible precursors for the textile block system - Lloyd Wright, Griffin and William Nelson. I've heard it in my profession, too: "We hire and train our competitors . . ."
"Would this actually be the first structure where the cantilevered trellis occurs above windows?" When did Wright add the marquee over the entrance to his Oak Park studio ? 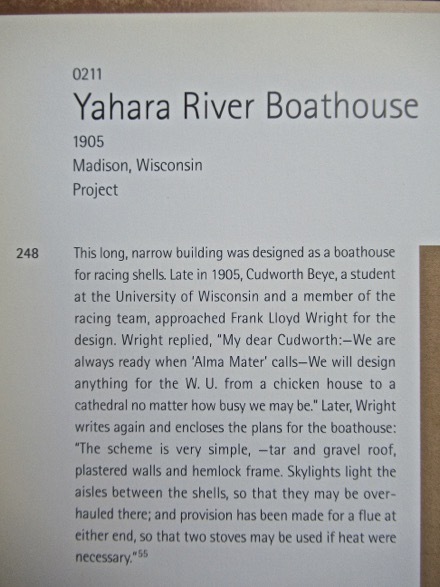 I've always thought there was a kinship between the Coonley Playhouse and the Yahara Boathouse project. Particularly with respect to the axial, clerestoried "nave" and lower side spaces that make up the central form. pinwheel symmetry of the second floor (so labeled, on the second sheet). I didn't realize Call was so late. I pay little attention to dates. They vary from publication to publication. SDR, the marquee was added to the Studio in 1911 for the remodeling into a residence for Catherine and the kids. Coonley Playhouse, Unity Temple, Yahara Boathouse, Call Building are all of a piece. All but the Call building made it into Wasmuth, in time to astound and delight the Europeans. Wright could rightly claim to have pioneered that vital branch of the modern movement -- and did.